Electricity has become an integral part of our daily lives. Most of the things we do and the devices that we use are dependent on electricity. For using power, there are different tools which help in making it favorable for personal use. Two such methods which are most commonly used are known as generators and motors. The simple definition of them is pretty simple, a generator is a device which converts mechanical energy into electrical energy while a motor is a device which converts electrical energy into mechanical energy. This is the first and main difference between them while there are several more. The central principle for running a DC generator is faraday’s law of electromagnetic induction while the main principle used for the working of a DC motor is that of induction. Another difference between them is that a DC motor follows Fleming’s left-hand rule while DC generator follows the right-hand rule of Fleming. For the case of DC motor and generator, direct current electricity is shown as out for the first one while direct power appears at the output for the latter one. Both also have different equations for measuring the required value. 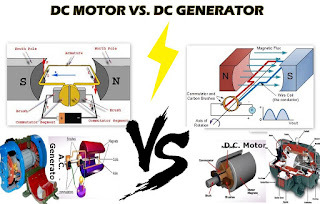 There are certain cases in which a DC motor can start working as a DC generator but that is not the case vice versa, and a DC generator can also function as a DC motor. They both have similar components, but some of them are different, that is because both have different working and the way they produce the output is not similar as well. One thing can be said about them that both are the form of converting energy but in their own way. Both have different types with compound, shunt, long and short the main types of the direct current motor while series, compound, and shunt as the main types of direct current generators. There are some other differences between these two as well which will be detailed later, but an extensive explanation of both these devices is given in the next two paragraphs. A simple DC motor has a coil which is wrapped around in a magnetic field. Two brushes which are present at each end which supply current to the motor when they move, this is done when they come in contact with the split ring. Force is applied to the wires which stay in a neutral magnetic field, and torque is generated by the coil. Regarding equation, force is applied to a cable which has a particular length and carries a current in the magnetic field. The force will be denoted by F, Length by L, current by I, while a magnetic field with B. The angle between the coil and magnetic field is iLBsinѲ which is usually 90 degrees when the field is vertical. The DC Motor follows Fleming’s left-hand rule but for the direction of force the right-hand rule is followed. The coil is primarily considered as an electromagnet then the path can be found by curling of fingers of the right hand in the direction of current and the thumb will point in the north. The Stator and Rotor play a significant role in the working of the motor, the effect of split ring and brushes, therefore, cannot be neglected. When the direction turns, flat brushes are no more in contact with the split rings and torque generated by two different forces. This is a device which converts mechanical energy into direct work by its working. This is done with the help of induction principle which is the basis of DC motors as well. Since a DC generator can be used as DC motor, they both are known as a DC machine and therefore have a similar type of working. The outer part of such as generator is known as a yoke which is made of steel usually. It gives strength to the system and keeps all the internal parts safe. Two poles are present at each end which is joined with the yoke by welding, these include windings. The windings are made from copper and are placed on the poles which are connected in series and form the north and south poles required for the working. There is a commutator brush system which is set to build connections with the armature windings, the primary role of the commutator is to trap current which is produced during the process, the number of commutator segments is equal to the number of coils present. When a conductor is placed in a magnetic field, an electromotive force is generated in the conductor, if there is no path this current moves on the specified path which then goes to the electromagnetic field. This produces an induced EMF, which can be calculated with the help of Fleming’s right-hand rule. A DC motor converts electrical energy into direct power output while a DC generator converts mechanical energy into direct electric power. A DC motor can be converted into a DC generator while the vice versa is also possible. DC motor uses the left-hand rule of Fleming while DC generator uses the right-hand rule of Fleming. Main types of DC motors are Shunt Wound and Compound Wound while the main types of DC generators are Series, Shunt and Compound wound. More power is generated if more force is applied on a motor while a generator always works as a fixed rate. There are always confusions in the two terms Motor and Generator, although people know they are different from each other, they do not really have an idea how they differ from each other and what is the main functions of these two. This article has given a simple explanation to make people understand the functionality of the two terms.